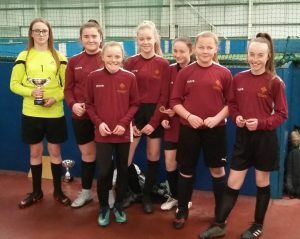 The girls were competing yesterday in the Northern finals of the ESFA girls 5 a side football competition. The girls did fantastically well and finished joint top of the league on 10 points. Their record was identical to the eventual winners Macmillan Academy and drew the game with them 2-2. They missed out on qualifying for the national finals by goal difference with Macmillan having a better goal difference by 3. 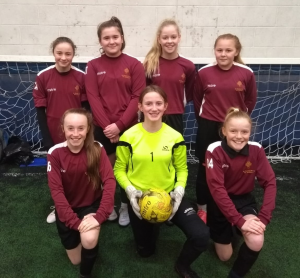 On 23rd January 2019 the Year 7 (Under 12) girls football team took part in the Northumberland Schools 5-a-side County Finals. The tournament was held at Evolution Football Centre at Royal Quays and each game lasted 10 minutes. The St Thomas More team consisted of Erin Cockburn, Jennifer Devine. Lainie Heathcote, Jenni Francis, Faye Newton, Kate Durie and Lucy Fitzpatrick. We kicked off the tournament with a game against Ovingham Middle School. It was a tough game to start but we managed a draw. Next was Chantry Middle School, Morpeth. The final score was 5-2 with some excellent goals from our team. Our third game was against Richard Coates Middle School, Ponteland where we continued our winning streak with a 1-0 win. With two games to go we were starting to feel confident. Gosforth JA was our next opponent – another win 2-0! We knew if we won our last game we would win the Northumberland Cup. It was against our local rivals Valley Gardens who we knew were going to be hard to beat. The score was 0-0 with only a couple of minutes to go then Kate Durie scored a brilliant goal to win the game! We had won the Northumberland Cup! At the end of the tournament we each received a medal and the cup was present to our captain Erin Cockburn. As the winners we will be representing Northumberland S.F.A in the North East Regional Finals on the 6th February 2019 in Durham. Wish us luck!